I’ve been an avid reader my whole life, so when I was asked to review The ABCs of Autism Acceptance by Maxfield Sparrow, and saw that it was "only" 152 pages, I thought, "this won't take long to read, so sure, I'd love to!" I was wrong. This is the largest 152-page book I've ever read. In fact, I wrote more notes for this book than I did for a 500-plus page book I reviewed in 2015. The book's title is straight-forward: Maxfield uses the Roman alphabet as a way to educate the reader about autism acceptance from an autistic person’s point of view, while interlacing quotes and links from other Autistics. The resulting resource makes this book an invaluable asset to furthering Autistic acceptance. 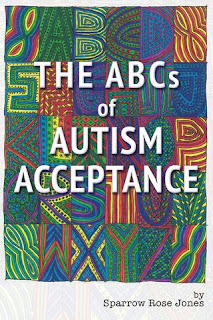 The ABCs of Autism Acceptance started out as a self-challenge for the author during the controversial month of April. I remember the post in which Maxfield began discussing this undertaking. I also remember thinking, what a fantastic idea! It was time to take April back and show why, without acceptance, autism awareness is actually a huge disservice to autistic people. Sparrow also aimed to make this book relatable to a diverse audience. Something a fellow Autistic could read, but so could our siblings, our teachers, our doctors, our friends ... and other people too. Especially people well outside our ally circle. We need them all! Everyone needs to read and absorb that sentence. Autistic people are not broken versions of our normal selves. Living life feeling that way is an early death sentence. I feel like this needs to be the benchmark for how we're treated. If you're not seeing us this way then you have some work to do. Coming into being autistic later in life means I've struggled with just how much love has come to mean pain for me, in one way or another. And I don't mean things like heartbreak, from the loss of some one/thing/place. When I write "love has come to mean pain for me," I'm remembering all the times I took on the weight and overload of a person/place/thing, etc., and it ended up costing me self-respect and dignity. I struggle 'til this very day with a choir of ghosts-of-the-past in my head, singing “everyone hates you." Autism awareness does absolutely nothing to fix these kinds of crises for autistic people. "Awareness" would like you to think the crisis is us, and the increase in autism diagnoses. But the crisis is really what's not happening for us. I went a decade, my entire 30's, without a doctor. Various medical professionals still don't take my over- and under- reactions to medications seriously. Just last week, I was totally shut down by a doctor because I said there was a link between Ehlers-Danlos syndrome and Autism, and the doctor took umbrage with that. I knew autistics had trouble being taken seriously by medical professionals before I read Sparrow's book, but now I've confirmed that I am not alone in experiences like these. Autism "awareness" fails us Autistics, time and time again. This really hit me hard. One of the most sobering things I've ever experienced in my life was the reading of the names of people with disabilities who had been murdered by their parents—at the time 70 people in five years—for the 2015 Disability Day of Mourning. I read a poem from a past submission of another autistic poet. I participated online. The number of autistic and disabled people killed grows, and doesn't slow. Awareness isn't making this horror any better. Awareness get murdering parents put on TV, and people somehow rationalizing parents' killings of their disabled children. This is why acceptance is desperately needed. It will save Autistic people’s lives! Having someone push me to overload after they've been educated about, and agreed to, the boundaries I put in place to help me with things like trust—that is something I really can't take any longer. I pay such a huge personal price. That relationship doesn't stand much of a chance, not without big changes on their part. I feel like I lose my dignity when I melt down, even though I know it's not my fault. If the person pushing me past my boundaries into a meltdown was able to see me through a lens of acceptance, would they still act that way, still insist on hurting me? I doubt it. I deserve to maintain my dignity. It's so hard to have it stolen away. And besides, we Autistics are pretty loyal people. Why wouldn't you want our trust? Awareness would make you believe Autistic women couldn't possibly even get along. And awareness still tries to erase us with outdated statistics. But I, and countless other Autistic women, will tell you a very different story. I was recently on a women's panel at an autism conference, with two Autistic women in our 40's, and two in their 20's. We were all so different—but our commonalities were so powerfully connecting that our differences became things to celebrate. We don't just need acceptance from society, we also need to accept ourselves, and it is imperative to have reflections of ourselves, to allow that to happen. I ended up reading and writing this review in April, and took The ABCs of Autism Acceptance many places with me: It went to a lunch where an Autistic woman close to my age saw herself reflected back as turned the pages, which made her light up. I took it to my doctor's office and she said she'd like to read it. It's important to get to know this book. Sparrow has, in my opinion, succeeded in what he set out to do: create something that a diverse audience could read and learn from. I came away with so much new knowledge and validation, and a desire to learn more. Note: All page numbers are from the paperback version of the book.